When all you need is a basic understanding of goniometry and manual muscle testing, supplemented by concise and illustrative examples of techniques, look to Cram Session in Goniometry and Manual Muscle Testing: A Handbook for Students & Clinicians for quick and at- your -fingertips facts. Cram Session in Goniometry and Manual Muscle Testing by Lynn Van Ost is a descriptive quick reference that provides the rehabilitation professional with a very basic approach to various techniques. Organized in a “head-to-toe” format and with over 400 photographs, Cram Session in Goniometry and Manual Muscle Testing takes user-friendly and efficient learning to a new level. This handbook is unique in that it takes the information published inside Cram Session in Goniometry and Cram Session in Manual Muscle Testing and combines them into one succinct resource. Readers will enjoy the benefits of both of these books, now in one compact and affordable format. • In the Goniometry section, subdivisions are broken down into type of joint, capsular patterns, average range of motion for each movement, patient positioning, goniometric alignment, alternative methods of measurement, and patient substitutions. • In the Manual Muscle Testing section, subdivision are broken into the specific movement to be tested, average range of motion, prime movers of the movement, the secondary movers, the anti-gravity subject position, gravity minimized subject position, stabilization and grades, substitutions for the movement, and points of interest for that particular muscle group. 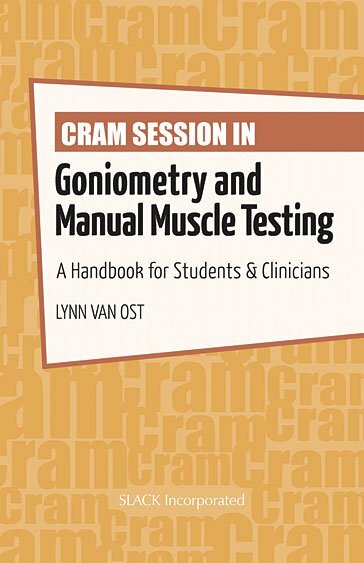 Cram Session in Goniometry and Manual Muscle Testing: A Handbook for Students & Clinicians is an informative, well-organized handbook for all students and clinicians in physical therapy, occupational therapy, athletic training, orthopedics or any allied health professional who treats musculoskeletal disorders. Lynn Van Ost, MEd, RN, PT, ATC, graduated in 1982 with a bachelor’s degree in nursing from West Chester State College, West Chester, PA; National Athletic Trainers’ Association Board of Certification (NATABOC) certified in athletic training in 1984; graduated in 1987 from Temple University, Philadelphia, PA, with a master’s degree in sports medicine/athletic training; and received a second bachelor’s degree in physical therapy in 1988 from Temple. In addition to treating the general orthopedic population as a physical therapist, she has worked with both amateur and professional athletes and has more than 11 years of experience as an athletic trainer working with Olympic-level elite athletes at numerous international events, including the 1992 and 1996 Summer Olympic games. She currently works as the Director of Physical Therapy for University Orthopaedic Associates in Somerset, NJ.